First, I drew a black and white line drawing on paper and sent that in to the group, but later in the week I decided to colour it (in Photoshop, as I never could afford Copic markers). 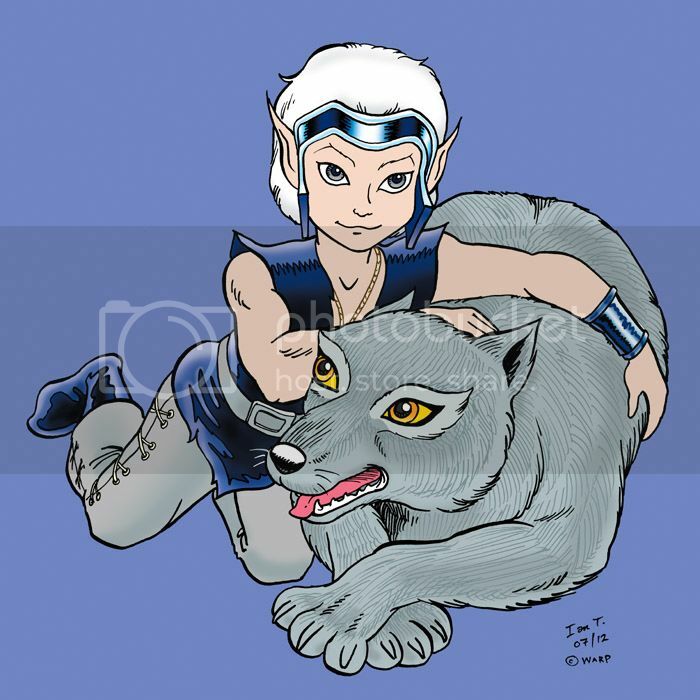 My aim was to get a strong composition, foreshortened from above, showing a young Skywise and his wolf, Starjumper, in as close to authentic Elfquest style as I could manage. I decided to have Starjumper looking at Skywise, and his ears being back was a deliberate decision. Originally, I was going to render Starjumper's fur in black lines, but I think this works better. Drawing these characters came very easily to me, possibly partly because I first drew them when I was young. My first encounter with Elfquest was via the original release of the first two issues, bought off the shelf at Space Age Books in Melbourne in the late '70s. Wow, that was a while ago.